According to Sgt. Bill Pratt of the Riverside County Sheriff’s Department on June 28, 2015, about 8:30 pm, officers from the Temecula Police Department responded to a reported hit and run traffic collision involving a motorcyclist with serious injuries in the 31800 block of Rancho California Road in the city of Temecula. 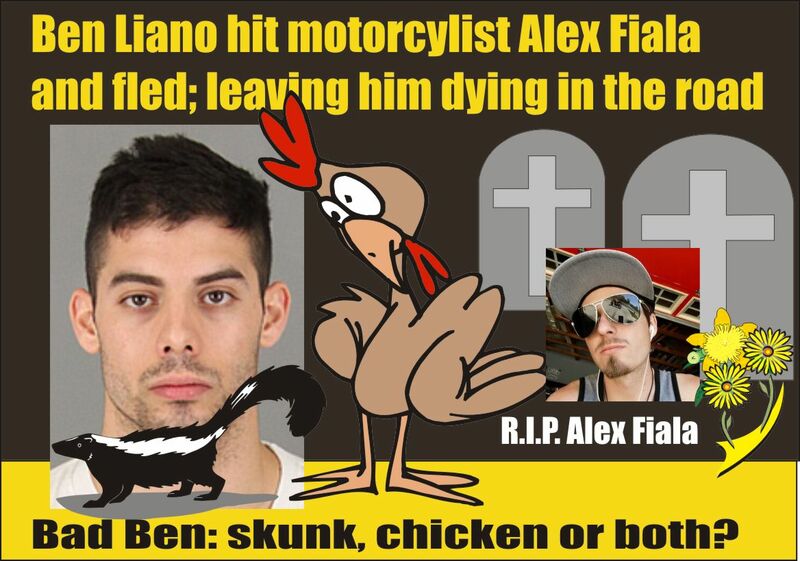 The suspect in the hit and run, Benjamin Liano, 22, of Temecula, was detained nearby. The motorcyclist was transported to Inland Valley Medical Center where he succumbed to his injuries. Liano displayed symptoms of alcohol intoxication and was booked into the Southwest Detention Center for suspicion of driving under the influence and vehicular manslaughter. Anyone with information for this case should contact Officer Epp of the Temecula Police Department Traffic Reconstruction Team at (951) 696-3073. This entry was posted in DWI arrest photos, DWI Arrests by State, DWI crash photos, Hell-hole bars, Hit and run DUI DWI drivers, Illegal drugs, injury or death and tagged Alexander Fiala killed by DUI driver Benjamin Liano, Benjamin Liano charged with killing motorcyclist while DUI, California Highway Patrol, Coachella Police Department, Driving Under the Influence, driving while impaired, driving while intoxicated, drunk driving, DUI, DUI fatalities in Temecula Calif., DWI, Inland Valley Medical Center, Officer Epp of the Temecula Police Department, Riverside County Sheriff's Department, Temecula Police Department DUI arrests. Bookmark the permalink.